It could be any fish. We get fresh fish in the local market. Cooking fresh fish and eating it straight from the oven is delightful. 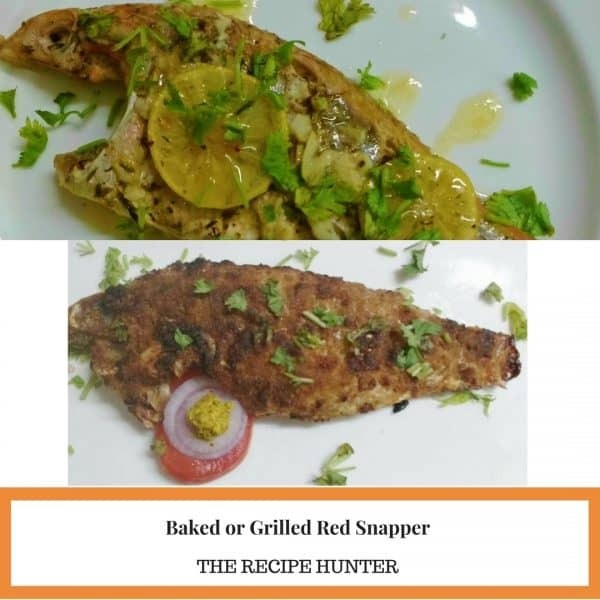 Baked Red Snapper is easy to cook, could be ready in few mins. with commonly available spices at home. The baked Fish recipe I found in a culinary website. Followed it as it is. The grilled one is my own version, a crunchy smoky Red snapper. Wash the fish in running water especially the belly. Pat dry. Make a vertical slit on the fish. Prepare the marinade with lime juice, Seafood seasoning, minced garlic, salt, and oil. Fill the slits with the marinade nicely on both the sides. If you have fresh thyme then place it or spread the dry thyme over the fish. Arrange the lemon slices over the fish. Arrange it over a silver foil. Fold it from all sides and make a packet. Preheat the oven to 250C. Bake the fish for 20 mins in 180C. Fish will release its juices and will be cooked. Heat butter and 1 tsp oil in a pan. Pour lemon juice over it. Switch off the gas. Plate the fish and pour the sauce over it. Garnish with chopped cilantro/coriander leaves. Pound 2 clove of garlic and 2 tbsp chopped onion. Add salt, pepper, (red chili flakes-optional), lemon juice and olive oil. Coat the fish and its belly nicely with the marinade. Place the marinated fish on a silver foil. Sprinkle breadcrumbs over the fish. Preheat air fryer, place the fish along with the foil for grilling. Keep the foil open(do not pack it). Grill for 10 mins at 180 degrees Celsius. You will find the breadcrumb over the fish has dried. Pour either melted butter or olive oil over it and grease the crumb. Grill for another 5-7 min. Serve it with onion rings, tomato and mustard sauce. Yum… that sounds perfect for today. Hugs.